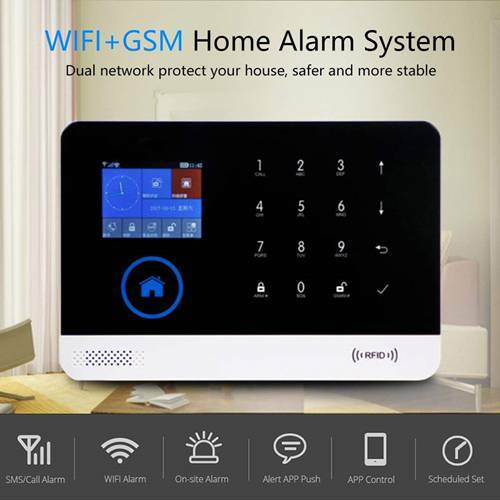 Gsm & Wifi Wireless Alarm System Is Used to Guard the Area as Well as Property Using Gsm Cellular Technology. 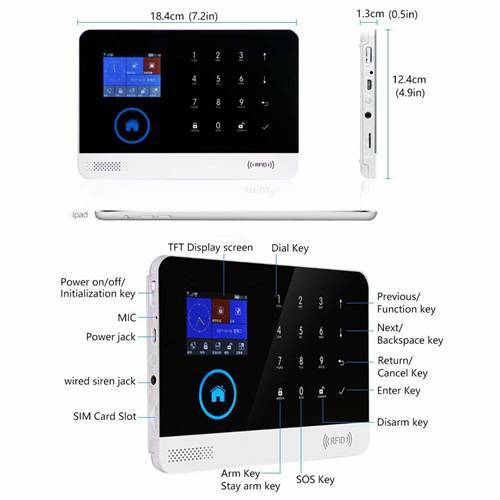 The Main Objective of Gsm System Fitted With the Gsm Module Is to Determine the Fact of Invasion to the Controlled Territory and to Aware the Owner by the Phone or Mobile Phone (Call,sms,app). Support Timing Arm and Disarm Function. Cpu Master Based on 32-bit Cortex-m3 Core. 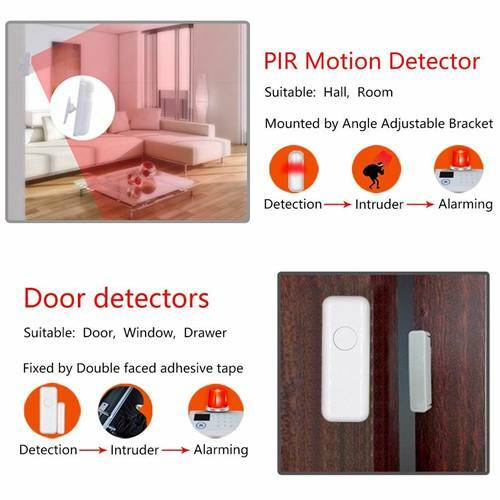 Support Door Bell, Internal or External Wireless Siren. Can Be Record 20 Seconds Voice Message and Alarm Voice. Entry/exit Zone, Indoor Zone, Perimeter Zone, 24-hour Zone. 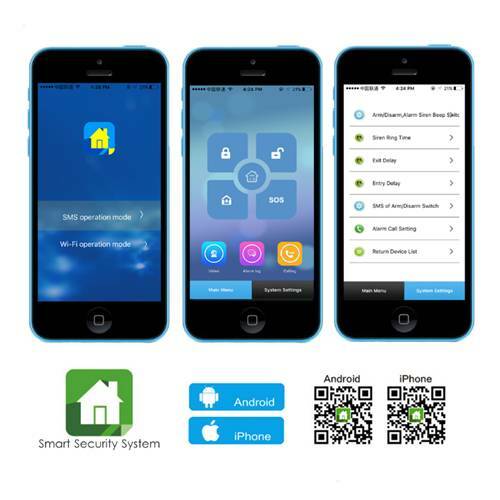 "Smart Security" App Can Be Download at Ios or Google Play. Store and Inquire Daily Operation Records and Alarm Records. 2.4 Inch Tft Color Screen, Voice Prompt Design During Setting. Telephone Call Out Function and Support 5 Groups Re-dial Number. Multi Language Menu Display, Voice Prompts and Alarm Sms Setting. 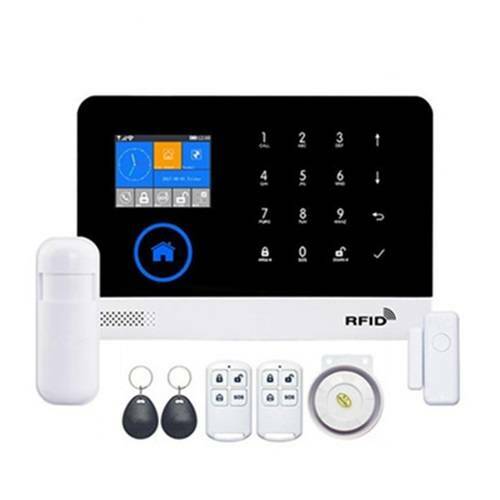 100 Learning/storage for Remote Control, Rfid Cards, Wireless Detector. Support Sms/call/app Remote Arm/disarm, Parameter Setting and Accessory Management. Main Power Malfunction, Backup Power Shortage, Tamper Alarm and Other Extended Alarm. Clock Synchronization, to Ensrue Accurate Clock, and Support Country Time Zone Setting. Up to 5 Groups Preset Alarm Phone Numbers, Sms on/off and Dial on/off Can Be Set Respectively. Many Defense Zones, Gate, Sos, Bedroom, Window, Balcony, Perimeter, Smoke, Gas, Carbon Monoxide, Water Leaking. Wifi Connection Only Support 802.11b/g/n 2.4g. Only Support 2g Gsm Sim Card or 3g/4g Sim Card Including 2g Transmission Service.